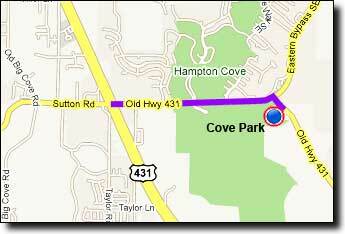 This ride is 75 miles, starting at the Cove Park ballfields near Hampton Cove. 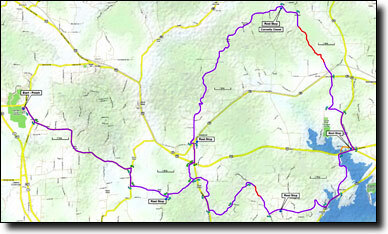 The route has two climbs and many hills; it also travels along Lake Guntersville for a few miles. Most of the roads are lightly traveled with good pavement but there are two sections of rough pavement in the valley between Grant and Nat mountains. There are two major climbs, the first is Babe Wright up Grant at mile 22. The descent down off Grant on Swearengin five miles later includes a sharp switchback. The second climb is Larkinsville CR-17 at mile 40. The two mile descent down off Nat Mountain at mile 54 includes two sharp switchbacks not far from the top, then mostly gentle curves to the bottom. The total elevation gain is 3,020', starting at 580' with a maximum elevation of 1,610'. Just after the convenience store at mile 33 there's an optional one mile out-and-back lakeside road, a nice detour if you're up for the extra mileage. 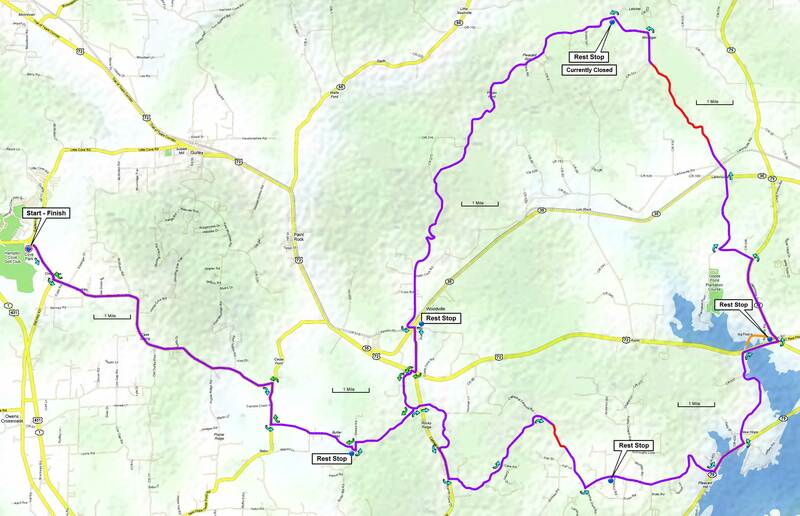 If you'd like a shorter ride, skip the out-and-back to the loop by starting in Woodville for a 46 mile ride.